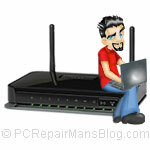 A new report states that over half of all homes are vulnerable to WiFi hacking. More shocking to many people is that nearly half of all home Wi-Fi networks in the UK could be hacked within five seconds, according to a report by CPP reasearch. When we setup or install a wireless network, we always encrypt it for these reasons. Some encryption can be easily broken so we always add the strongest settings possible. Using proprietary software on one of our laptops we can break into an unsecured network in seconds and many secured networks in less than a few minutes. Obviously we do this for penetration testing and audits when required, but the effect of having an unsecured wireless network can be costly, annoying and time consuming for private individuals and businesses alike. We have seen networks where neighbours unknowingly (or knowingly) connect onto the client’s WiFi and effectively share their broadband. Worse still, a malicious person could redirect all of your traffic to another site first, stealing credit card and password details easily. Please ensure you always have your wireless network secured and that your password is never simple to guess (eg “password”, “abc123”, “letmein” etc). A combination of non-dictionary words, numbers and greater than eight characters makes breaking in very difficult.